Healthy Hair Diary: I Plan. God Laughs. Hi Lovelies! It’s been a while! I was not well but I’m a lot better now. I am not going to get into all the painful details because I’m soooooo ready to put it all behind me. I have a lot of catching up to do with work, school, et cetera and I intend to finish them all before the end of this month. I knew I followed a lot of blogs but the reality of it hit hard when I saw over 400 unread posts on Bloglovin alone! E-mails are not as bad because I get notifications on my phone but I still have a bit to go through. I hope all has been well with everyone and thanks again Reni J for dropping by to leave a comment while I was missing in action J, is it cheesy that I feel extra special about that?! To me I think the only reason I passed the first two goals is because I was either at home or at the doctor the entire month so in my mind they don’t count as a pass. The opportunity never presented itself for me to buy anything, there was no challenge. I intend to attempt these goals again because failure is not an option in these parts! I can’t wait to catch up on how everyone journeys are going, I know a few ladies have done their touch-up since they do them around every 12 weeks and a few others are about to do theirs. To all the ladies attempting a long stretch, we are in the same boat and if I had my relaxer I would be jumping overboard, I am 15 weeks post today, more about that in another post. 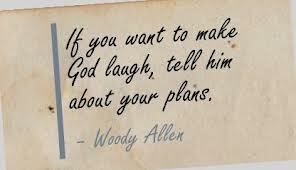 How many times have you felt that Woody Allen was spot on with that quote? Its good to have to back and healthy too yay! Only the other day I looked for your blog in my Google reader feed, because I realized you haven't posted anything in a while but I figured life got busy. God is good all the time, stay blessed. great to have you back, ,candice! Hopefully you will get completely better soon. Glad u're back and feeling better! glad to have you back !!!! don't worry I'm sure you'll make it with your goals!! it's all about time !! awww i thought you were perhaps busy. i am glad r better now :) welcome back! Woody's quote has been the story of my life over the past month! Everything I planned somehow got derailed, so I can definitely relate. Glad that you are feeling better. As for your "passes," a victory is a victory...take it! LOL! To bad not all victory feels like a victory lol I'm not going to cry over spilled milk though! Aww I'm glad my comment helped a little and glad you're feeling much better now, it's great to have you back! Setting goals for the last week is also a good idea seeing as I've pretty much failed all of mine this month! Lol. So far things are going well with my goals, it is actually easier to accomplish them this way so most likely I will stick to doing them this way.